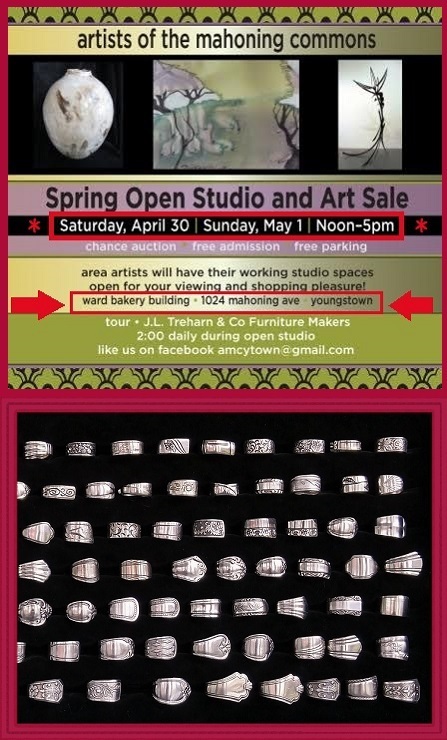 Ward Bakery Building Spring Open Studio and Art Sale - Carmichael Inc.
CARMICHAEL invites all of our loyal customers, and those who haven’t met us yet, to join us at the Ward Bakery Building Spring Open Studio and Art Sale this year (2016). The event is sponsored by the Artists of the Mahoning Commons. We’ll have Jewelry, Accessories, & Flatware Art (all make nice gifts for Mom) on display at the show. This is the place to go if you want to support local Artists/Artisans from the Youngstown, OH area and you’d like to steer clear of the shopping malls when shopping for Mom this year. When is the Ward Bakery Building Spring Open Studio and Art Sale? We’ll have a nice selection of Spoon Rings at the show ! !